This is one of those records that took me a while to appreciate. I got it back when it came out, during my freshman year of high school. Back then I was a huge Nirvana fan, and I read somewhere that REM was an influence on their sound. So I blindly picked up the most recent REM disc. Needless to say, I hated it. It was so mellow, so acoustic, and above all so weak. Or so I thought. 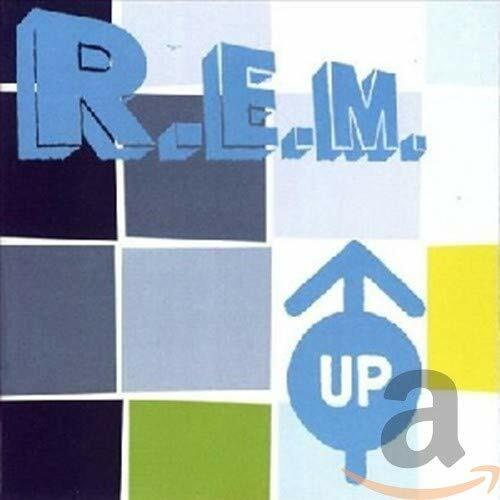 This record was released after REM’s longtime drummer Bill Berry left the band, and it shows. Yes, there are some live (sounding) drums, but drum machines pepper the record. Not that this is a bad thing; they really add to some tracks, like the halcyon “Airportman”, a track drive more by Michael Stipe’s tranquil lyrics and by looped windchimes than by drums. The standout track on the album is the blissfully concise “Why Not Smile.” This one has harpsichord among other things, but it works. Beautifully. Stipe’s melody resolves to the tonic on each line, reinforcing the track’s otherwise staid “Don’t Worry, Be Happy” theme. There are one or two sleeper tracks that have not, and perhaps will not, grow on me. The song “Diminished”, no standout itself, segues into a sparse acoustic number, “I’m Not Over You.” This vignette doesn’t work. The guitar is a little too sparse, sounding like it was recorded on a boom box. The song sounds incomplete and unfinished — an isolated island in a sea of creativity — almost as if it were an afterthought. The only other song that doesn’t really do it for me is “You’re in the Air”, a trip into falsetto that is best left to Radiohead’s Thom Yorke. But these are merely good tracks on what is a fantastic album. Staunch headbangers like my fourteen year-old self will be disappointed, but grown music aficionados will find it strangely appealing. This record is the perfect one to fall asleep to. Not because it’s boring, but because it’s soothing. A wonderful melody and a drum loop can be strangely soporific.